Some senior athletes have been athletic all their lives, and their bodies stay strong as they age. But some senior athletes were middle-aged couch potatoes, and it’s those seniors that are inspirational to those of us who only plan to run when we’re being chased. Meet four seniors this month who made it into comfortable middle age or more before hitting the gym, the pavement, or the record books. Caregivers, loved ones and home care aides all know that some of us just need a little extra inspiration in our day, and now we’ve found it! Octogenarians Kay and Joe O’Regan took up running 31 years ago, at age 49, when their son complained about having to run on the London rain to train for his rugby team. Like good parents, they told him he wouldn’t melt, and when he whined some more, they went running in the rain with him. Thirty-one years later, Kay and Joe celebrated their 80th birthdays together by crossing the finish line at the Cork City (Ireland) Marathon hand-in-hand, together. Over 57 years of marriage, almost 150 marathons, and races on multiple continents, Kay and Joe have enjoyed the competition with each other, and with the other members of their Irish running club. Before last month’s race, they declared it would be their last one – but the adrenaline rush after the race had them both rethinking that promise. As long as they do it together! Ernestine Shepherd discovered the gym in her late 50’s, when her sister convinced her to join one. It wasn’t love at first sight for Ernestine. But a couple of years later, inspired by her sister’s tragic, early death, she dove into weightlifting with a spirit, and competed in her first competition at age 71. Oh, and earned a Guinness Book of World Records title – Oldest Female Bodybuilder. Nine competitions, a book, and a successful coaching practice later, Ernestine runs 10 miles day at 2:30am, before hitting the gym to pump some iron. Ernestine knows her story is as inspiring as her physique, and she lives to motivate and encourage people to get healthy, and even to compete in bodybuilding if that’s their thing. Her dreams, now? Meet her idols – First Lady Michele Obama, who has some guns of her own, and of course, Sylvester Stallone, whose egg-white drinking regimen she adopted. She has the Eye of the Tiger – as her ringtone, natch – for sure! What do you do after becoming the world’s oldest skydiver in 2013? You chill out for three years, and then become the oldest Olympic torch bearer ever at age 106. 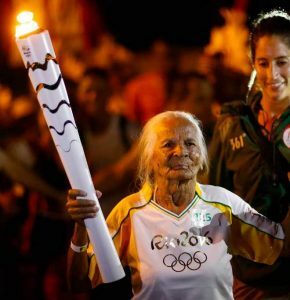 Aida Gemanque of Brazil smashed the previous record held by a 101-year-old Russian last month when she carried the Olympic flame on part of its journey through the Amazonian city of Macapa. The torch’s 95-day journey will take it through 325 Brazilian cities and the hands of nearly 12,000 runners before the torch ceremony on August 5th in Rio. Carrying the Olympic torch is an honor few people are given, and Aida’s record will be tough to beat. She is proud and overjoyed about her feat, and won’t say whether she has any other ‘extreme’ records in her sights.